Eritrea has sent a complaint to the UN Security Council complaining about Egyptian security's shoot-to-kill policy of Eritrean refugees attempting to cross illegally Egyptian borders into Israel, diplomatic sources in New York tell Ahram Online. According to one source, the Eritrean complaint, which was signed by President Isaias Afewerki, suggested that Egyptian authorities are opting for a bloody approach to border control that, in the words of the letter, "violates human rights." This is the second complaint to be forwarded to the UN Security Council about Sinai in less than six months. Last summer Israel complained about a lack of security and border control in Sinai, claiming that the situation undermined Israeli security. Israel is less upset now with Egypt on Sinai, and according to New York diplomats it is not objecting to the border control mechanism that Eritrea is complaining about. On the contrary, according to one Egyptian diplomat, Israel "is speaking rather positively about the efforts of Egypt to check Islamist militant operations in Sinai, even if it is underlining the need for more to be done." 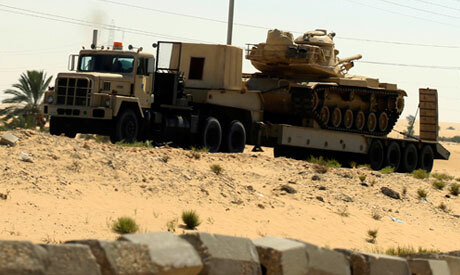 During the past few weeks, Egyptian military and police forces upgraded their operations in Sinai. On the one hand, Islamist militant groups have been attacked, and on the other, illicit tunnels built between the long-besieged and impoverished Gaza Strip and Sinai for the smuggling of all sorts of commodities, including basic needs, have been flooded by Egyptian forces. "Sinai is not clean yet. It would take much more work to clean it completely, and it is not easy," said a security source who works in Sinai. According to this source, there are two reasons why Sinai remains troubled. The first is what he qualifies as "a not so forthcoming willingness on the side of the presidency to apply a firm approach towards Islamists". The second reason, which the source says is more important, are "the strong links between Islamists and Sinai tribes" based on "financial interests and sympathy." "It is the tribes that provide them with refuge and ways of escape," he added. Last August, some 17 Egyptian borders guards were attacked and killed by Islamists during a Ramadan breakfast. Following the attack, President Mohamed Morsi removed the head and his deputy in the Supreme Council of Armed Forces (SCAF). At the time, "Operation Eagle' was initiated to comb Sinai for Islamist militants. President Morsi announced that he "personally" was "leading the operation." According to military sources, however, its first week aside, the operation was hesitant in general. "There is a limit to how far we could go in using force to attack militants without causing serious civilian causalities. This is a concern that prohibited us from opting for tough military choices," said one military source. The source added that at other times the "state leadership" was not fully supportive of the choices of some military commandors in charge of the operation. The disagreement between presidency and army on the management of Sinai is an open secret, according to military and political sources. "They don't see eye to eye for sure. Sometimes one side succumbs to the wish of the other, and sometimes it goes the other way round," said an informed political source. Last December, Minister of Defense Abdel-Fattah El-Sisi, appointed by Morsi last August, issued a decree restricting the possession of property in Sinai to second generation Egyptians. The decree was interpreted by some political sources as the "army's reply" to plans contemplated by the presidency to sell large parts of property in Sinai to non-Egyptians (some suggested Qataris and others said Palestinians of dual nationality) for purposes of investment. Today, the Egyptian mission in New York is trying to convince members of the UN Security Council that the killing of Eritrean refugees by security forces in Sinai "is not at all deliberate." Meanwhile, the army is still trying to contain the restive Islamist militant spots in the peninsula. "Sinai is a tough challenge because we know that the only way to fix the situation there is to pump in massive investment. But there are no investment offers coming our way and our economy is far too frail to allow the state to start a Sinai development scheme that is already there," said a government source. He added that for the near future Sinai would remain a security rather than "development" file, "even though we know this is not the right approach."